Do solar panels produce toxic waste? Solar panels are frequently lauded for the clean, eco-friendly energy that they generate, but there is now growing concern about what becomes of them once they reach the end of their lifespan. Read on as we attempt to answer the question: do solar panels produce toxic waste? With climate change and resource depletion proceeding apace, more and more faith is being placed in alternative energy sources like solar and wind. Unlike our present, fossil fuel-based, methods of generating electricity, solar technology produces next to no harmful carbon dioxide emissions; it converts sunlight directly into electricity. All that is required is that the panels have access to a decent amount of sunlight during the daylight hours. And even during periods when the sun isn’t shining, advancements in storage and battery technology mean that solar panels may still be a viable option even under less than optimal environmental conditions. And that’s not all. Compared to the process of mining, refining, and transporting fossil fuels, the manufacture of solar panels is far less energy-intensive and generates far fewer harmful emissions. Sounds great right? But perhaps the outlook concerning solar technology is not quite as rosy as some of its enthusiasts like to claim. 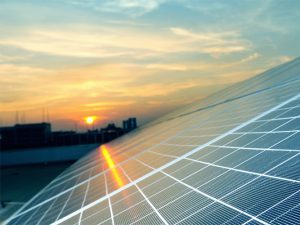 A growing number of environmental scientists and even solar industry leaders are voicing concern about what happens to solar panels at the end of their lifespan. You see, solar panels are not exactly easy or affordable to recycle (more on this below). 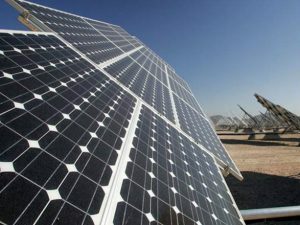 And if they end up in landfill – which is currently the case – there is the risk that certain toxic materials – like the lead, chromium, cadmium, plastics, antimony and other rare earth materials currently involved in solar panel manufacturer – will be washed out of the solar modules by rainwater, and leach into the surrounding soil. Similar results may eventuate when solar panels break apart as a result of extreme weather events like storms, flooding, hurricanes, earthquakes, tornadoes and the like. There is actually precedent for this already. During a 2015 tornado in a southern Californian solar plant, many of the solar panels were damaged, and were found to fail hazardous waste tests – and hence couldn’t be sent to conventional recycling plants. Unlike fossil fuels, which are actually just plant and animal matter that has been compressed over many millions of years, sunlight (at least by the time it reaches our plant) is a very diffuse energy source. Thus in order to be capable of meeting our substantial energy requirements, many solar panels need to be set up in suitable locations. Hence a lot of solar panels will eventually need to be disposed of, and a lot of waste will be generated. In fact, according to IRENA – the International Renewable Energy Agency – at the end of 2016, there was already approximately 250,000 metric tonnes of solar waste around the globe. And as more and more solar panels are produced, the problem is only expected to get worse. By the reckoning of IRENA, by 2050, there could be over 78 million metric tonnes of the stuff floating around. Thankfully, some states are now being proactive on the issue of toxic solar waste. For example, the state of California is currently exploring what to do about the problem of solar waste. One solution frequently raised to this problem is the mandatory recycling of solar panel materials. This would eliminate the problem of leaching of toxic chemicals into the soil when solar panels are left to degrade in a landfill – and would also address the quandary of the scarcity of certain materials involved in the manufacture of solar panels, likely to become an issue in the future. According to an IRENA 2016 report, if recycling of solar panels at the end of their lifespan was made mandatory, in excess of 15 billion USD worth of materials could be recovered by the year 2050. But who would take responsibility? Solar technology is still in its relative infancy, and many new solar manufacturers have already gone bankrupt over the last decade; imposing further costs and responsibilities on them would be likely to make life even more difficult for these outfits. And any solar panel recycling business would have a hard time of it too in this economic climate, due to the costs of employing workers to disassemble the panels, and the minimal demand for scrap metal. Whilst in the long term, resource limitations may make it imperative to recycle solar panels, at the present time, it actually costs more to recycle defunct modules and recover the materials, then it does to simply mine new raw materials. That is the reason most solar panels currently go to landfill. If it is not economical to recycle solar panels, then it will have to be mandated by governments, and the costs of managing toxic solar waste will need to be born by the taxpayer. Last year the state of Washington became the first state to do this. Whilst perhaps a viable solution in wealthy countries, governments of developing nations are still ill-equipped to deal with the problem of solar waste, due to a smaller tax base, under-developed infrastructure, and the lack of an established waste management system. They are the countries most likely to suffer the consequences of solar waste. There is also the risk that these nations will become the destination for the majority of ‘recycled’ solar panels that contain low quality, toxic materials. Indeed, according to the UNEP – United Nations Environment Program – between 60 percent and 90 percent of ‘e-waste’ already ends up – illegally – in the world’s poorest countries. Mandatory recycling of solar panels could simply exacerbate this problem. As mentioned, due to the diffuse nature of sunlight by the time it reaches our planet, converting the sun’s rays into electricity is always going to require a much more substantial amount of materials – glass, rare earth minerals, and heavy metals – compared to other means of generating electricity. And, in turn, that means much more – often, toxic – waste that will eventually need to be disposed of. Unfortunately, there is no easy solution to the problem of toxic solar waste. Any effective response will require a coordinated effort on the part of international, national, state and local authorities. The first step is to impose an extra charge on the final purchase price of solar panels to make sure the cost of managing solar panel waste is internalized, and not shifted onto future generations. This charge would go to a national fund for safely disposing of and decommissioning used solar panels. The funds would be dispensed as needed by local and state governments charged with the task of removing, recycling and storing solar waste. Even if individual producers go bankrupt, the waste they generate will still be safely disposed of. Heavier international regulation will also be needed to tackle the risk of solar e-waste ending up in poorer countries, particularly severe here due to the number of materials involved. None of this will come quickly or easily, but if the growing scientific evidence about the toxic nature of solar waste is correct, it does need to happen is disastrous environmental consequences are to be avoided. And who knows? Perhaps it will spark new innovations in solar PVC technology so that hazardous materials and rare earth metals are no longer required in their manufacturer. That would be a real ray of sunshine on the solar horizon. What are Incandescent Bulbs and How do They Work? What are Security Flood Lights and Do they Deter Burglars? for the disposal of solar panels.And WHY isn’t he demanding they make solar panels without toxic materials?